The Sound Credit Union’s staff tells Jamela Mohamed to remove her headgear while they attended other clients with their caps on. Jamela Mohamed posted video on Facebook alleging discrimination in Sound Credit Union, Kent, Washington. Staff at the Sound Credit Union in Kent, Washington, apparently, asked a Muslim American woman to remove her headgear before taking service. Jamela Mohamed, the alleged victim, wrote on her Facebook account on May 6 that she is Muslim woman and was observing Jummah the previous day – Muslims observe Friday for prayers and, mostly, Muslim women keep their heads covered. Mohamed wrote that she had gone to pay her bill, as in any other day. However, that day being a Friday, she had her head covered. When the staff objected, she went back to her car to grab a hijab (a headgear and article of faith for Muslim women). To her surprise, when she returned, she noticed that while she was refused service because of her headgear, two other people, who were wearing caps, were being attended without objection. “The teller asks me to “take off my hood”. In order to adhere to their policy, I ran outside to get my hijab. When I came back, two men before me were served with no issues, but both were wearing hats,” Mohamed wrote on Facebook. Member of the South Credit Union, Mohamed pulled out her phone camera and started recording the incident on the spot. The video shows that a woman staff member asks Mohamed to stop filming and leave the place at the count of three, or else she would call the 911. Eventually, Mohammed was escorted out of the premises. 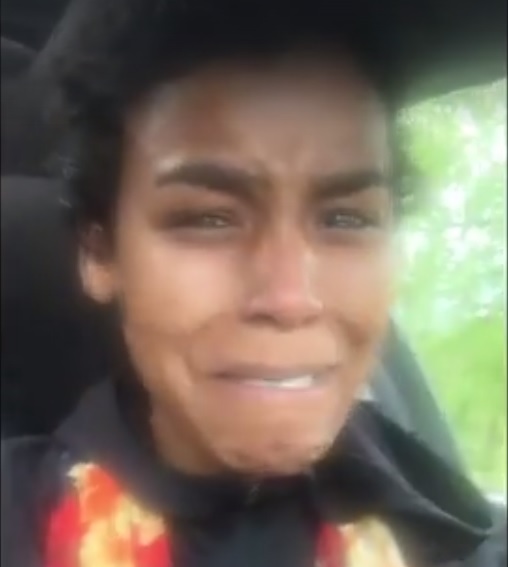 In the video, Mohamed is seen crying and complaining that she was “completely embarrassed” and that “the lady [staffer] literally followed” her out. “I never want this to happen to anybody and NOBODY should ever be treated this way,” she said. The one-minute-34-second video, which looks edited in a couple of places, was viewed more than 870,000 times on Facebook; Nearly 8,500 people shared it online. As a credit union, we believe in equal treatment for all. The purpose of the bank rules against head or face coverings is to allow the facial-recognition software used by law enforcement agencies to identify bank robbers. Bank robbers usually cover their faces so that they can’t be recognized by human witnesses or identified through the use of software. Some kinds of hats or scarves do not prevent the functioning of the facial recognition software, and in such cases the bank staff might not tell a customer to remove the article of clothing. But other kinds of face coverings do inhibit the ability of the software to identify someone in the bank. If the bank allows Muslim woman to keep their faces covered while in the bank, then it won’t be long before robbers show up pretending to be Muslim women, or some other “religious” group whose faith calls for the covering of the face at all times while in public. Jamela Mohamed wasn’t discriminated against. She edited her video to make it seem that way. The bank demanded that she remove her face covering because they realized that it functioned as a disguise from the point of view of the facial recognition software that banks, and law enforcement, depend upon to catch criminals. This controversy is a tempest in a teapot, a manufactured controversy, that probably has, as its purpose, putting pressure on banks to make themselves more vulnerable to armed criminals in the future.